...and that's just the bike. Riding thousands of kilometers through London's many potholes, and mercilessly bangin' up her kerbs takes its toll. Here's my road bike with its cracked rear drop-out and broken axle. 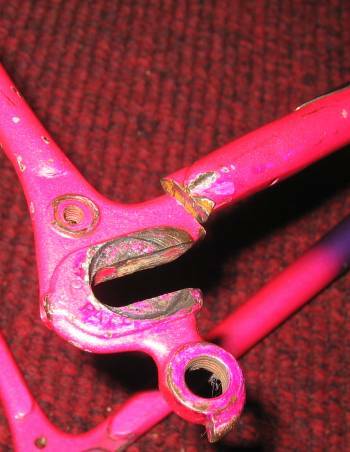 I was riding the frame cracked for a few weeks >:-) which probably did the axle in. That frame will need fixing by a professional bike frame builder. Incredibly, the only one in South England I'm aware of–and I've certainly looked–is Argos Racing Cycles in Bristol. Update Jan 2004: Argos did a great job of welding a new drop-out in, and after some home spraying the bike's looking fab. Jan 2005: seems to be holding up well against the usual abuse! Note: for those stuck in the Measurement Dark Ages [e.g. Britain, USA] a kilometer is like a mile, only shorter. Which is nice, when you're on a bike.